The “Freedom Lawn” I referred to stems in part from Redesigning the American Lawn, by three biologists from Yale University; Herbert Bormann, Diana Balmori, and Gordon Geballe. I say “in part” because the “lawns” and savannah-like glades I briefly presented at the symposium require very little maintenance as opposed to fertilized and chemically treated traditional lawns, but in contrast are refugia for specialized, mostly native vegetation, including mosses and lichens, and wildlife that require such conditions (see photos below). In short, they are high quality, semi-natural areas vs. the mostly artificial, weedy lawns featured in Redesigning the American Lawn (reducing or eliminating fossil fuel usage notwithstanding). 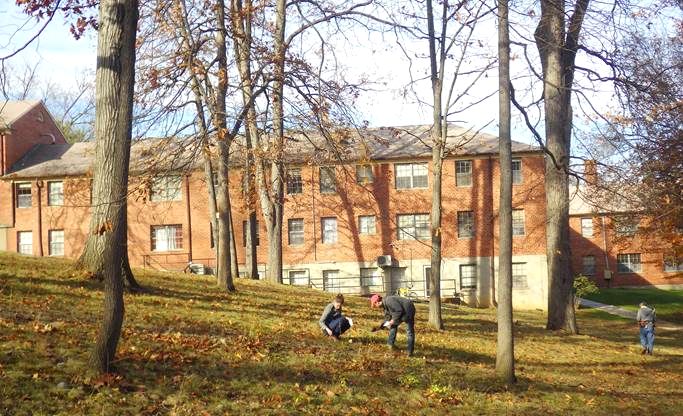 Moreover, the native “lawns” offer the appropriate native species and habitat for pollinators. Most of these native “lawns” occur in oak (and oak-hickory) overstory savannahs and glades – places where the forest understory was removed long ago and maintained as such but were not farmed; hence the native soils, soil micro-organisms, and seedbank for diminutive native grasses and wildflowers are retained. This is a common feature throughout Maryland, D.C., and Virginia. Old-age Acidic Oak-Hickory Forest grove on south-facing, gravelly colluvial slope at Barcroft Apartments, Arlington County, VA. Pignut Hickory (Carya glabra), Sweet Pignut Hickory (Carya ovalis), and Mockernut Hickory (Carya tomentosa) are all co-dominant canopy trees of the grove. Poverty Oatgrass (Danthonia spicata), woodland carices (Carex spp. ), and a host of diminutive wildflowers comprise the “no-mow,” low maintenance, chemical-free turf. Photo by R.H. Simmons. Fertilizers, lime, and pesticides destroy most native grasses, wildflowers, and wildlife, including eventually, the canopy oaks. Apart from golf courses and athletic fields, they are not necessary and should never be used. This also includes leaf compost and manure – both of which are only appropriate for agriculture, gardens, and traditional lawns, and will disrupt and eventually destroy the balanced, acidic soils, soil micro-organisms, and flora of woodlands, as well as foster the growth of non-native invasive plants. Nutrient-loading feeds pathogens that destroy trees and native biodiversity! Natural woodland glades and “lawns” should never be over-seeded by commercial grass seed mixes or wildflower seed mixes. No tilling or soil amendments are recommended – soil disturbance is the main cause of non-native invasive species. Shade (even moderate shade) from canopy trees greatly limits the growth of most turf grass species, most of which are light-demanding. The many species and varieties of Red Fescue (Festuca rubra) are an exception and will grow and persist in shade. However, all commercially available species and strains of Red Fescue are not native. If removing existing turf grass in shade is the goal, consider hand-pulling or shallowly digging out robust clumps or sections of grass and periodically and carefully applying iron sulfate (never aluminum sulfate) or elemental sulfur (Garden Sulfur) evenly over the grass according to the manufacturer’s recommendations. This will gently acidify the soil and further restrict the growth of turf grass, while favoring mosses and other woodland plants. Many of the species native to grassy areas listed below are not readily available as seed from nurseries. An alternate source for many of them is responsibly collecting seed material from clean meadowy areas locally, and supplemented by pots or plugs from specialized native plant nurseries or rescued material. Carefully pull or dig non-native weeds. When one finds open, grassy areas dominated by the species below, it typically indicates a healthy, diverse, and sustainable community. Species diversity is typically greater on mafic soils of the Triassic Basin in the Piedmont vs. acidic, sandy-gravelly soils of the Fall Zone and Coastal Plain. Poverty Oatgrass (Danthonia spicata) – dominant and widespread; forms a continuous turf with lots of room for other plants. not Deer-Tongue Grass (Dichanthelium clandestinum). Three-awn Grass (Aristida spp.) – mainly in sunny, open areas on mineral soil. Poverty Grass (Sporobolus vaginiflorus var. vaginiflorus) – mainly in sunny, open areas on mineral soil. Parasol Sedge (Carex umbellata), Black-edged Sedge (Carex nigromarginata), Reflexed Sedge (Carex retroflexa var. retroflexa), Shaved Sedge (Carex tonsa), and many other low, woodland carices. 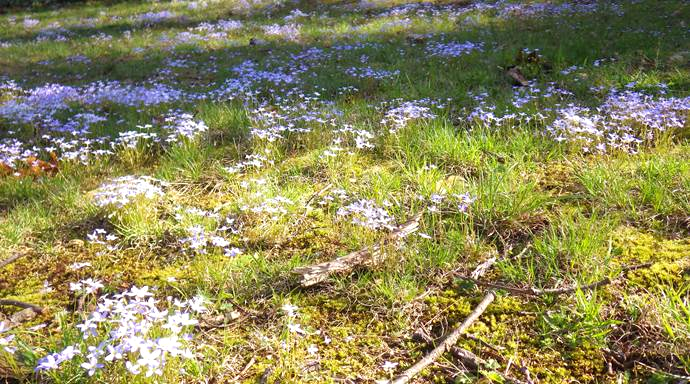 Common Bluets (Houstonia caerulea), Poverty Oatgrass (Danthonia spicata), mosses, and woodland litter and duff in open “lawn” along the Mount Ida escarpment in the City of Alexandria, VA. Photo by R.H. Simmons. Trailing Bush-clover (Lespedeza procumbens); also Creeping Bush-clover (Lespedeza repens) – both prefer some sun. Pussytoes (Antennaria spp.) – need some sun to bloom well, otherwise it’ll remain non-flowering. Dwarf-dandelion (Krigia virginica) – in sunny, open areas on mineral soil. Pinweeds (Lechea spp.) – need some sun to bloom well. Pineweed (Hypericum gentianoides) – in sunny, open areas on mineral soil. St. Andrew’s Cross (Hypericum hypericoides ssp.) – Spp. hypericoides is rare in the greater D.C. area. Blue Toadflax (Nuttallanthus canadensis) – needs some sun to bloom well, otherwise it’ll remain non-flowering. Dwarf Cinquefoil (Potentilla canadensis) – dominant and spreading. Common Buttonweed (Diodia teres) – in sunny, open areas on mineral soil. Field Pansy (Viola bicolor) – in sunny, open areas; also other Viola spp. Healthy, low maintenance glade of upland oaks and Poverty Oatgrass (Danthonia spicata), woodland sedges (Carex spp. ), and diminutive wildflowers on the flat, gravel terrace at Arlington Forest Park, Arlington County, VA. Photo by R.H. Simmons. White Oak trees don’t readily display problems. By the time they are visible these problems are often too far along to correct. The state of the oaks reflects our changing global patterns. Multiple factors are involved, none of which are coincidental. 1. They are obligatory species for mycorrhizae (composite organ of nonwoody roots). The fungal component and the organ itself are sensitive and easily disturbed. 2. The non-woody roots of White Oaks are concentrated in the upper soil horizon and tend to spread laterally and form thick mats. 3. The tree depends on the degradation of annual leaf layers and the diversity of other organic soil components (living, dying, and dead). Soil damage from events such as logging or urban construction (including gardening) can trigger serious problems for White Oaks and other obligatory species. This is one reason that White Oak, Hickory, Beech, and other obligatory species don’t fare well as street trees. 4. Forest trees tend to be tall and less wide than open grown trees. In urban areas many trees were cleared leaving remnant forest White Oaks, allowing them to grow large and broad. Larger trees have a larger energy budget for metabolic processes, including defense. When stressed by disturbances, energy reserves are diminished. 5. White Oaks tolerate drought, but not constant wetness. The cultural practices of removing leaves, planting grass, and using fertilizer salts and irrigation reduce mycorrhizae and the biological diversity of soil. Larger trees with a now smaller root system and a compromised energy budget set the stage for root rot. These trees, in turn, become more prone to uprooting. Preserving and increasing the size of natural areas will aid trees and the organisms they support. Planting trees in clusters or allowing nature to reclaim open spaces with pioneer species will help retain the diversity of species and of aging stages. Street trees can be planted in rotation cycles. Terrific post. Thanks to Virginia Native Plant Society and Rod Simmons for sharing this information. Thanks, Michael! We appreciate your comment. I take it, Melinda, that you’re in the Coastal Plain of Virginia somewhere? If so, the suite of flora for woodland glades and native “lawns” will include many of the same in the list, but some others as well. It’s also important to know if you’re in an upland or lowland, as much of the material in this blog posting is the predictable and natural native flora that emerges in semi-open conditions under upland oaks (and hickories) and would be outcompeted by similar flora native to mesic to damp conditions. This is a good reminder to provide the next installment of native “lawns” for those conditions! I will try and do so soon. One thing we all have to do with weeds like Chickweeds and other spring lawn weeds when we want to improve conditions and favor native vegetation is to hand pull and bag all such annual winter/spring plants before they go to seed (there’s still time on many of them). Large patches of these also usually indicate areas of grass that have been heavily fertilized or nitrified in the past, creating highly favorable conditions for these weeds to monopolize. Here’s where the garden sulfur and iron sulfate come into play – follow directions on the bag and continually spot treat these areas to suppress future seed growth. And there’s nothing at all wrong with doing this work in phases. In some ways, it’s the ideal method, rather than wiping out a whole lawn all at once and hoping to replace it immediately with native vegetation. This is unrealistic and nearly impossible to do. Getting patches or “islands” of desirable, appropriate native “lawn” species growing while you phase in destroying old turf and lawn weeds over time will have observable effects fairly quickly. And of course, be mindful of tree roots that will be numerous and close to the surface (oaks definitely included!) to not disturb them by tilling or digging (never till soils around forest/canopy trees! ); changing drainage or grade; or adding odd/unnatural elements (lime, gypsum, fertilizers, green sand, Hollytone, aluminum sulfate, rock phosphate, etc.). Our willow oak seems to want to kill our lawn. The leaves are maybe too small to get sucked up into the mulching mower? We have huge bate spots now that are being colonized by non native weeds. The chickweed is incredible. I’d be happy to encourage the type of lawn in this article, after hand pulling areas of weed. Any advice? Can I get the right kind of seed to overseed with? I take it that you’re in the Coastal Plain of Virginia somewhere? If so, the suite of flora for woodland glades and native “lawns” will include many of the same in the list, but some others as well. It’s also important to know if you’re in an upland or lowland, as much of the material in this blog posting is the predictable and natural native flora that emerges in semi-open conditions under upland oaks (and hickories) and would be outcompeted by similar flora native to mesic to damp conditions. This is a good reminder to provide the next installment of native “lawns” for those conditions! I will try and do so soon. Working on a “moss lawn” in mesic damp conditions with many canopy trees in the Coastal Plains region has been a slow process but am now seeing plants that you have mentioned along with shade loving natives.The thing that is different with the moss lawn is removal of all leaves. This area was covered with leaves and branches for many years, but the moss quickly spread once the leaves were removed. Now seeing Pink Lady’s Slippers, Canefly orchids and Ebony Spleenwort growing in the moss. Thanks for providing tips on what not to do. Thank you so much, Mary Lou, for sharing with us your success in persisting with the native lawn. It must be beautiful, and so beneficial to the local ecosystem. Bravo! Thanks Mary Lou and Sue. Yes, a lawn of mostly mosses (and other bryophytes) is the “Holy Grail” of many folks seeking a natural setting! Indeed, many native wildflowers and especially shrubs like Kalmia latifolia are virtually dependent on open mineral soil and moss for successful germination. This also only happens in healthy, stabile environments where soil disturbance and weeds are absent or at a minimum. Because of the high levels of mycorrhizae in the soil in a natural, acidic setting like you describe (which follows mature/old-age oaks and pines), the seedbank of native orchids like Cypripedium acaule will germinate, along with native woodland grasses and others. And the reward for all of this is not having to mow or maintain a lawnmower (except for shredding leaves in fall)! I have a lawn dilemma that I’ve been trying to solve and would love any advice that could be had. I live on a small lot (around a tenth of an acre or so) and most of the yard is a hill. I have been trying to convert the hilliest part of the yard into a pollinator and bird friendly area, but still would like to keep some grass or grass like area for my dog to use. My yard is pretty much full sun in most places (no tall trees) and the soil is clay once you get a couple inches down. I live in western Virginia so our summers can be quite hot and humid with bouts of little rain in July and August. Are there some native grasses and other plants that you could suggest for my area? I would like to phase out all the grass I have eventually with native grasses that don’t require the use of fertilizers and weed killers for upkeep (I have stopped using them, but worry about dandelions and other weeds taking over). Another problem I have is Bermuda grass, but I don’t think there’s anything to be done about that. I would really like to return my yard to a more natural state while still following the city’s regulations about maintaining my grass. Thank you!! We suggest targeting small areas instead of trying to take on too much at once. Choose a focus area to start with, experiment with what works well on your site, and then expand outward from there. Thanks for the link and information! I’ll take a look at it. I would recommend Purpletop (Tridens flavus var. flavus) as the grass species to use in this situation. It’s easily obtained as seed (Ernst Seed; just this species, not one of their mixes though!). It will do beautifully on a slope over clay soil. You can mix in lesser amounts of the appropriate, common local native meadow plants with the Purpletop grass if you like. For accuracy in selecting appropriate native meadow wildflowers for your county, I would suggest finding the nearest analog to your site and using those species as a template, as well as consulting the Digital Atlas of the Virginia Flora as to local nativity of flora. You might also like to add a canopy oak or two at a strategic spot, and sumacs do beautifully in these settings – to further diversify the site beyond herbaceous plants for pollinators, wildlife, and aesthetics. 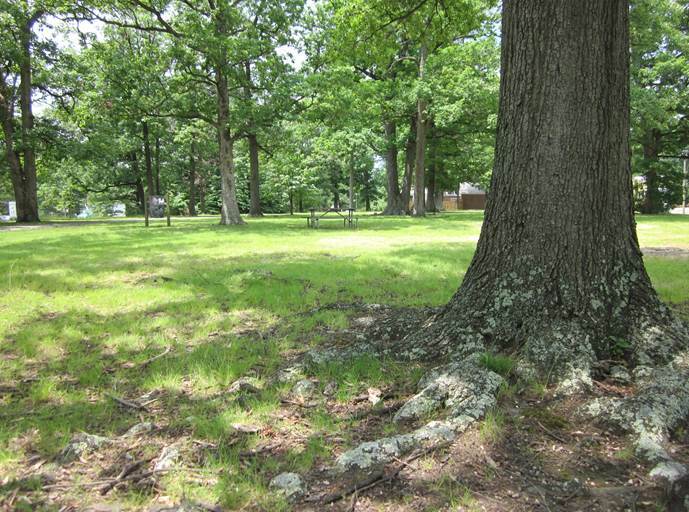 (Oaks and other shade trees are best planted as small stock – saplings up to 1-1.5″ cal.) Moreover, shade is the best way to kill of Bermuda Grass and other light-demanding, non-native turf grasses. Nonetheless, the site will naturally evolve and diversify. Thanks for the response! I’m definitely going to look into that grass variety. Does anyone have any recommendations about the best way to seed it since I already have a lawn? Most of what I read about replacing an already existing lawn requires extensive use of Round Up, which I don’t want to do. I was wondering about trying to de-thatch and aerate the section of yard I want to do first and then reseed the area with the Purpletop in the fall. Does know if this approach may be successful? Thank you for your post. I was just considering using lime in my back yard to remove the moss that I can’t keep from growing under my white oak and pignut hickory. On one hand I like it but I don’t like that I seem to have flurries of weeds that travel through my yard. Now that I think about it, they don’t spread so much in the part of my yard that has the moss. Nevertheless, I’ve been mowing it, removing the sticks and leaves, etc. But it sounds like you think I should leave it to go? Except in the fall to mulch the leaves? I unfortunately cannot identify any of the more rare natives to save my life but I’m attracted to the idea of the “no mow” zone. Thanks for sharing your post and any thought would be appreciated. It all depends on how you’d like your lawn to look and what you’d like its composition to be. Some folks hate moss. Some folks love it. I like it because it “specializes” in covering bare mineral soil well and helps suppress weeds, as well as being highly attractive and natural. It grows at the ground level beneath the grasses and other herbaceous plants, much like a “micro” groundcover. If you like the idea of a “no mow” (or semi-annual mow) lawn, then perhaps you’d consider continuing to mow primarily in late fall to shred leaves and sticks, etc., leaving them in place? Controlling/hand-weeding occasional weeds is a constant, but a task that will likely diminish each year if one keeps up with it. And as you know, lime suppresses the growth of many mosses, so if you want to keep them, I wouldn’t lime the soil. I also wouldn’t be concerned about rare native wildflowers in the lawn; there probably won’t be any – only the common and predictable woodland savannah type flora, especially if you’ve got White Oak and Pignut Hickory as remnant canopy trees. If you have a natural woodland grassy herb layer like in the above photos, that’s far rarer and far more maintenance free than a traditional high energy lawn – and much more valuable and ecologically meaningful. If you like that look, I think your property and vegetation is much better off maintaining it than trying to make it something different. Hello, I have lots of Japanese stiltgrass growing where I’ve been trying to encourage moss growth. I’ve noticed that when I pull it the moss comes up with the roots. Can you recommend a chemical control that will kill the invasive grass and not harm the moss? Thanks in advance. Hi, great post. Just curious though, why did you mention “not to use fertilizers”? Aren’t fertilizers helpful in keeping the soil and basically your lawn healthy? Thanks! Very nice! This is more or less what I am experimenting with under the bur oaks and Hill’s oaks where I live in Wisconsin. It’s been relatively easy on my sandy soils, which already supported a fairly sparse lawn. Danthonia spicata, Dichanthelium species, Antennarias, Erigeron pulchellus, Carex species (esp. C. pensylvanica, C. umbellata, C. albicans, C. eburnea, C. blanda, and C. siccata), and Viola species are my go-to plants. More Midwestern plants include Besseya bullii, Pulsatilla patens, and Sisyrinchium campestre. I’ve noticed that midland shooting star seedlings are only establishing on patches of moss. Another plant with promise is Pedicularis canadensis, but so far I’ve only managed to get a couple going. Ultimately, I’m hoping its hemi-parasitism will add balance by keeping otherwise more aggressive plants in check.